ISLAMABAD: Prime Minister Imran Khan’s initiative to generate 10 million jobs over a five years period stands aligned with the findings of renowned world institutions to cope with the core issue of unemployment for ensuring a promising future for the youth of the country, according to a report. The incumbent government had announced an ambitious initiative to create 10 million jobs – 2 million jobs each year – while the United Nations Development Programme (UNDP) in its recent report had estimated requirements of some 1.3 million jobs every year. The country requires some 3.5 million jobs instantly to clear a backlog created due to unemployment over the years. 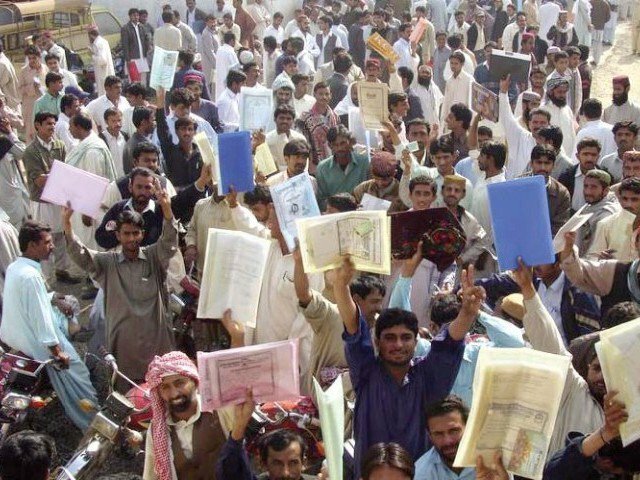 As per the UNDP report, combining the current unemployment figures of 3.5 million and additional requirements of 1.3 million brings the figure to the same target as fixed by the Pakistan Tehreek-e-Insaf (PTI) in its manifesto. According to UNDP’s National Human Development Report (NHDR), the growth in employment creation was necessary to match the unprecedented number of young people entering the working age. The additional jobs to be created per year were for the next five years, the report added. Experts believe that the job target set by the prime minister appears to be a step forward and convincing determination that needs unflinching efforts and huge economic impetus to disembark the desired destination. “Expanding the formal sector, supporting entrepreneurship, building the human capital of youth and active labour market policies are key instruments to ensure that the required growth is inclusive and sustainable,” the report added. The report suggested that the gradual increase in labour force participation rates means added pressure on the labour market with increased demand for employment opportunities. The report recommended that complete concentration on quality and not on creating enough jobs would be equally problematic while failure to produce additional employment opportunities could lead to 43 million people being unemployed by 2050. The agricultural sector, constituting Pakistan’s main source of employment (42.3 per cent), has immense potential for employment generation at both the farm and non-farm levels. The report also revealed another key sector of Pakistan’s economy, manufacturing currently absorbs around 15.3 per cent of the total employed labour force despite being hindered by energy shortages and the poor law and order situation. Overall, with the rapidly growing services sector becoming a major source of jobs in the country, Pakistan must ensure that this sector provides the young with a chance at long-term career progression.